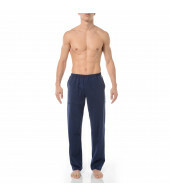 The Hom Origins Separables Long Pyjamas Bottoms are made from 100% lightweight cotton. The pockets and inner waistband are printed with narrow pin stripes. It features a thick elasticated waist for comfort and support and is designed in Europe by the very best French craftsmen. The Hom Origins Separables Long Pyjamas Bottoms are made from 100% lightweight cotton. The pockets and inner waistband are printed with narrow pin stripes. It features a thick elasticated waist for comfort and support and is designed in Europe by the very best French craftsmen. Material content: 100% Cotton. Wash with care.